Here's a fun experiment from our home lab science series to try with the kids! The Mad Science After-School Program at Bluffview Elementary in Dupo, IL was featured at in the Belleville News-Democrat. 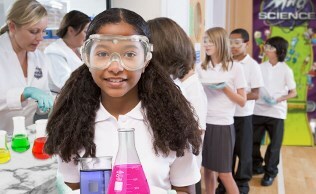 Frontiers for Young Minds is stirring up conversation in the world of science. This online journal is filled with cool science facts and tons of the latest news in scientific developments. The journal is edited by kids ranging from the age of 8 to 18. Be the first to post a picture of your family taking our November science challenge on our Facebook page and we'll send you a Mad Science t-shirt!